It may be of surprise to some that for Old Alleynians the worst day of the First World War was not the result of events in the totemic battles of the Somme, Third Ypres or the Ludendorff Offensive, but of one day in September 1915. Cumulatively these other battles saw a higher rate of casualties (73 OAs died on the Somme, seven on July 1st alone), but 25th September 1915 marks the single worst day in the First World War, and indeed, we believe in the College’s entire 400 years. On that day nine OAs were killed, all as part of the first day of the battle of Loos. 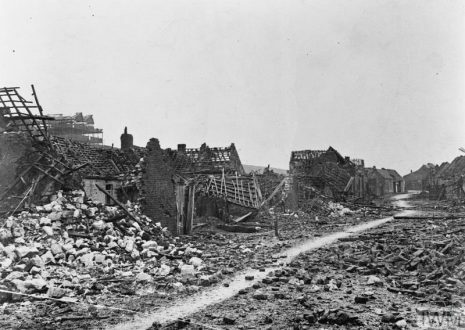 Loos was part of an Anglo-French offensive against the German front lines where British political and French military pressures overrode the concerns of British commanders on the Front to attack heavily reinforced German positions. The attack was a disaster, and the British lost 59,000 casualties in three days. Looking at the careers of these 9 is itself a window on the changing face of the British Army in the Great War: three were army regulars, those who has joined before 1914, and all were officers in Indian regiments; three were part of the Army reserve, those who has served in university OTCs, or left the army before 1914 or been part of the Volunteers; and three were those who had responded to Kitchener’s call in 1914, the New Army, most of whom would see their first day of battle on the Somme in 1916. 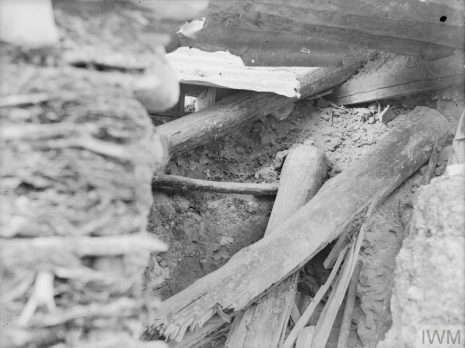 © IWM (Q 28973) The interior of a captured German machine gun emplacement, near Loos. Photo originally taken September 28th 1915, part of the Royal Engineers Collection. Lieutenant Thomas Percival Wood (1882-1915) went to Peterhouse, Cambridge after Dulwich (1896-1901) with a Classics Scholarship. He rowed for his College and joined the Cambridge University Volunteer Rifles. He taught English at the Lycée Ampère in France, University College, London and La Matinière College, Lucknow, India where he joined the Lucknow Volunteer Rifles. He went with the Gurkha Rifles first to Aden to drive the Turks back beyond Seikh Othwan. The regiment went on to France where he was killed in the battle of Loos. 2nd Lieutenant Cecil Gothet Weitzmann (1884-1915) went to South America when he left Dulwich (1896-1899) but at the outbreak of war he came home to enlist. He obtained a commission in the South Stafford Regiment and went to France in June 1915. He was attached to the 1st Battalion and was killed at Loos. Captain Laurel Cecil Francis Oldfield (1884-1915) went to Lincoln College, Oxford after Dulwich (1899-1903) with an exhibition in Science. He was called to the bar at the Inner Temple and specialised in Copyright Law. He was a member of the Inns of Court OTC and was given a commission in the Rifle Brigade when the war started. He went to France in July 1915 and was killed at Loos. Major Kenelm Ross McCloughin (1884-1915) at Dulwich (1899-1901) he played in the 2nd XV and 1st XI, topping the batting average in 1901. He then went to the Royal Military Academy, Woolwich and captained both the Rugby and Cricket teams. From the Royal Artillery he transferred to the 14th Sikhs, Indian Army. He was on home leave in 1914 and was attached to the 11th Service Battalion, The Royal Scots. After action at Festubert and Givenchy he was killed in a German counter-attack in the vicinity of the Hohenzollern Redoubt on the Loos front. Captain Henry Dobree MacCall (1882-1915) joined the army when he left Dulwich (1896-1899) and fought in the Boer War 1901-1902. In 1905 he transferred to the Indian Army and was posted to the 33rd Punjabis. In 1914 his regiment was first sent to Egypt to guard the Suez Canal and then to France where he was killed leading his company in the attack on the German trenches at Loos. Lieutenant Leslie Paul Long (1894-1915) went to Sidney Sussex College, Cambridge after Dulwich (1909-1912) with an open Science Scholarship. He had taken a first in Part 1 of his Natural Science Tripos but as a member of the Cambridge University OTC he applied for a commission in 1914 and joined the 20th Battalion London Regiment. They were in reserve at Neuve Chapelle and in the summer of 1915 fought around Givenchy, Festubert and then Loos, where he was killed. Captain Douglas Murray Hanna (1873-1915) After Dulwich (1882-1888) he worked in the tea industry in Ceylon (Sri Lanka) but had been in the London Scottish Volunteers and then the Colombo Town Guard. So in early 1915 he returned to England to volunteer and joined the 8th Service Battalion, Berkshire Regiment. He went to France in August 1915 and fell at Loos. Major Graham Douglas Campbell (1880-1915) went straight to the Royal Military College at Sandhurst when he left Dulwich (1891-1896). He joined the Bedfordshire Regiment and was posted to the Indian Army as part of the 40th Pathans. Being at home when the war broke out he volunteered his services to the War Office who asked him to assist in training. He was sent to France as a Double Company Commander and was killed in his first serious battle at Loos in the vicinity of Fosse 8. 2nd Lieutenant Henry Oliver Beer (1895-1915) was a senior scholar at Dulwich 1908-1914 and had a place at Caius College, Cambridge but took a commission instead in the 8th Battalion, Queen’s Own Royal West Kent Regiment. He was killed during the advance at Loos while leading his platoon against a position near Hulluch.